The SkyCaddie TOUCH, the flagship of SkyCaddie's new product lineup, features a glove-friendly, easy-to-use touchscreen with Bluetooth connectivity to provide golfers with the ultimate user experience and convenience when coupled with a FREE SkyGolf 360 mobile app. The TOUCH features a hi-resolution, sunlight-readable, color display that amplifies the clear superiority of SkyCaddie's 35,000 preloaded, high-definition maps over its competition. Don't compromise your game. Play with the most-trusted rangefinder in golf and start saving strokes. Golf's Most Brilliant Display. With its 5-inch, full high-definition touch screen driven by an ultra-fast multi-core processor, the SkyCaddie SX500 is the most powerful way to measure yardage while providing the very "best view" in golf with vivid graphics and super large numbers you can trust. The powerful features of the SkyCaddie SX500 are easily tapped with its large 5", intuitive touch screen and a host of automated features such as Auto-Course Selection, Auto-Hole Advance and Auto-Zoom, making it basically "touch-free" from the parking lot to the 19th hole. The large HD display combined with HD quality course graphics, only available from SkyCaddie, provide the best view of the most-reliable information in the game to allow you to play your best golf. Dynamic HoleVue. And now, the powerful processor of the SX500 allows SkyCaddie to introduce Dynamic HoleVue™, which automatically re-orients the entire golf hole from your position to the green as you progress from the tee. So, in addition to SkyCaddie's patented IntelliGreen® technology, golfers can now see the entire hole from their point-of-view. only from SkyCaddie! SkyCaddie Touch New In Box Fast Free Shipping First Year Membership Included ! 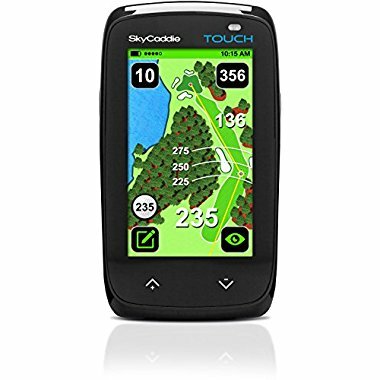 Find similar products to the SkyCaddie Touch New In Box Fast Free Shipping First Year Membership Included !